+Mr. George Goutsev was born in 1950 in Sofia, Bulgaria, where he resided for his entire life. He earned a Bachelor’s Degree in Fine Arts at the National Academy of Fine Arts in Sofia in 1973. He is an accomplished master iconographer. 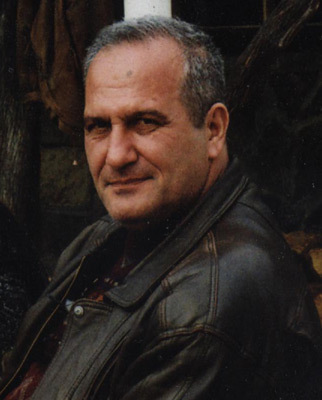 From 1992-2001, he relocated with his family to Nicosia, Cyprus. During that period, after receiving the blessing from the Archbishop of the Republic of Cyprus His Eminence Chrysostom, he painted the interior of All Saints Greek Orthodox Cathedral. Upon his return to Bulgaria, Mr. Goutsev undertook private commissions for hand-painted icons. In 2005, he began to write the icons for a new iconostas, hand-carved by his colleague, Mr. Peter Nedkov, also of Sofia, for Saint Anthony Orthodox Church in San Antonio, Texas. This exquisite icon screen was dedicated in 2007. In 2007, Mr. Goutsev painted on canvas, icons for the ceiling of Saint Anthony’s – Pantocrator, Platytera, and Angels. In 2008, Mr. Goutsev began to paint the icons for the Upper Wall Iconography Project, Phase II. To date, he has completed the Nativity of the Lord, Theophany, Transfiguration, Crucifixion, Resurrection icons. Plans are underway to complete this phase with an icon of the Ascension to be completed by year end 2011. In 2008, Mr. Goutsev completed another major project for Holy Trinity Orthodox Church in Willimantic, Connecticut. The original icon screen panels were retained as George painted new icons that were mounted behind hand-carved frames prepared by Mr. Nedkov. Mr. Goutsev prepares his iconography in the traditional, Byzantine style. He works under the influence of the magnificent mosaics of Ravenna and Istanbul, the icons in Bethlehem, and the murals and icons of the 16th century Monastery of Stavronikita on Mount Athos. Mr. Goutsev suffered a stroke in 2010. He fell asleep in the Lord on May 25, 2011. His work will be continued by his first wife, Cveta Marinova, also from Sofia, Bulgaria. To the servant of God, the iconographer George, may his memory be eternal in the sight of God!